Tag Archive | "Bashar al-Assad"
It’s true – China, Russia, and Assad have quite the love affair. It’s no secret that Russia and China blocked the Arab League’s request to the United Nations Security Council for intervention in Syria because of their own national interests. Russia loves selling AK-47s to Bashar al-Assad. China enjoys a monopoly over Syria’s imports. But it looks like their “official” reason for vetoing the resolution turned out to be a good one: what makes anyone think that the Syrian rebels are any less guilty of war crimes than Assad? Britain’s David Cameron and France’s Francois Hollande want the rebels to take over Syria. Other states are not so convinced, and for good reason. To-date, all UN and Arab League attempts to monitor the gruesome conflict in Syria have failed. Without proper monitoring, it’s near impossible to figure out who’s behind every reported massacre, bombing, or other attack. The current situation makes it extremely difficult to determine which belligerent is worse – especially now that reports claim that the Free Syrian Army (FSA) is engaging in the same sort of widespread acts of torture, murder, and sexual violence as Assad’s regime. Why the sudden evening-out between warring factions? The United Nations speculates that the increase in Islamic radicalist membership in the FSA is pushing the group to extremist measures (i.e. the head of Iran’s Islamic Revolution Guards Corps (IGRC) recently admitted that it was also operating in Syria). So now what? Simply put, the world will collectively continue to do nothing. States with selfish national interests will fuel whichever warring belligerent satisfies their agendas. Or perhaps they won’t get involved at all. A regional organization like the North Atlantic Treaty Organization (NATO) could, in theory, make a case in favor of intervention by arguing that there is a threat to the peace of its member state Turkey, or that a humanitarian threat exists. But unlike Libya, Syria poses no economic or political threat to NATO and its allies. No oil, and no immediate threat to democracy, means Turkey, and civilian Syrians, will have to fend for themselves. And states, who for international humanitarian reasons, want to get involved, can’t, because it’s impossible to figure out which side is worse. It’s also going to be difficult for “the sake of humanity” states to prosecute in the aftermath of this bloody tragedy. The International Court of Justice (ICJ), an arm of the United Nations, can’t get involved because it only accepts grievances between Member States of the United Nations. Non-state actors like the Free Syrian Army technically don’t count as a Member State. If anything, the ICJ could entertain Turkey’s complaints against Syria to make up for NATO’s lack of interest. The International Criminal Court (ICC), a product of the Rome Statute, is in the same boat as the ICJ: Syria is not a signatory to the Statute and the conflict is entirely internal. The Security Council remains tied by the Russian and Chinese vetoes, meaning that ad hoc tribunals like those setup for Rwanda and the former Yugoslavia won’t be an option for Syria as long as the Permanent Members can’t agree to invoke their Chapter VII powers. And there is absolutely no chance that anyone could rely on Syria’s broken judiciary to take care of war criminals domestically. It’s also possible that no international tribunal or international criminal case will come of this uprising at all. The world doesn’t seem to take interest in Syria the way that it did in Rwanda, Sierra Leone, Cambodia, and East Timor. 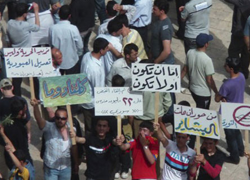 The current Syrian uprising is not the first of its kind in the country. An estimated 10,000 to 40,000 people perished in February 1982 when then president Hafez al-Assad, father of the current president Bashar al-Assad, launched a fierce twenty-seven-day assault on the central town to crush an Islamist revolt. Despite a bloody massacre that took over 10,000 lives within the span of a month (worse than the current uprising has in a year and a half), the international community failed to intervene on humanitarian grounds. Along with the ongoing uprising today, there now exist two counts of international nonintervention in Syria despite documented humanitarian crises. Like father, like son? Either way, it looks to be that international law, at least in practice, just simply can’t help Syria. On Monday, Syria rejected the Arab League’s plan to end violence within the country. Violence between protestors and opposition forces demanding an end to President Bashar al-Assad’s regime has been ongoing in Syria since March 2011, resulting in over 5,400 deaths during the ten-month time-span. On Sunday, the Arab League voted to extend the observers mission in Syria for an additional month. Syria rejected the proposal, which stated in part, that Syria was to establish a national unified government within two months. Specifically, the government was to hold free parliamentary and presidential elections monitored by the international community. The statement also called for Assad to give his vice president full power to cooperate with the new government in order to work under the transitional period. Syria fervently asserted that that the Arab League’s proposal violates its state sovereignty. 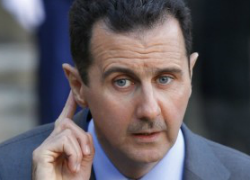 Syria also alleged that the plan interferes with its internal affairs. Opposition groups also opposed the Arab League plan, but for differing reasons. For example, the Local Coordination Committee (LCC) opposition group stated that the plan gives the current Syrian government a new opportunity and additional time to “bury the revolution” and arrange for peace; the LCC supports the notion of UN intervention in the violent revolution. As protests continue, the violence persists. People have taken to the streets in protest of the current regime, with 60,000 protestors in Douma, currently protected by army defectors. Reports state that there were 23 civilians deaths in Syria on Monday, and yet the reports could not be confirmed due to Syria closing its borders to foreign journalists. Other reports estimate at least 36 deaths. Also noteworthy is the fact that in Northern Syria, unknown gunmen killed an emminent leader of the opposition, Radwan Rabih Hamadi, during an ambush. Many within the international community have cried out against Syria’s quick refusal of the Arab League’s proposal. The United States and the European Union both backed the Arab League plan; with U.S. State Department spokeswoman Victoria Nuland stating that it was regrettable that Assad rejected the League’s transition proposal “almost before the ink was dry.” The European Union extended its sanctions against Syria after news spread that the country rejected the Arab League’s proposal, which added 22 more officials and eight companies to the blacklist. It appears that the next step will be UN Security Council action against Syria. The British mission to the U.N. supports bringing the issue before the Security Council for resolution stating that, “we continue to believe that the Security Council must act in response to the ongoing violence taking place in Syria.” The German ambassador to the U.N., Peter Wittig, said that the Arab League’s decision to seek the help of the international body was a “really bold step.” He went on to assert that, “we believe now more than ever that we will need strong council action, a clear message to both the Syrian regime and the Syrian people.” Secretary-General Nabil el-Araby declared that the Syrian government has failed to comply with the Arab League’s agreement to end the violence and that swift action appears to be imminent. As civilian deaths continue to mount in Syria because of the violence, the international community is becoming increasingly involved. With Syria’s failure to agree with the Arab League’s proposal to end the violence and establish a new government, the international community will surely take further steps to end the brutal killings of the Syrian people. The U.N., supported by many powerful Member States, is bound to take action against Syria soon. Without such action, an end to violence in Syria appears out of sight as the revolution proceeds well into 2012, stronger with each passing day.